23311 SW Bosky Dell Ln. The War on Aliens! Are they taking over your piece of the earth? How to successfully eradicate aliens . . .
Western North American wildlife has been challenged by introduced species since the pioneers cultivated the land. We continue to disrupt habitats that had bargained for centuries to achieve an equilibrium and support a rich diversity of native plants and animals when we introduce and encourage "exotic", or non-native, species that are invasive. Spreading out and inhabiting natural spaces, they often take over. The bullfrog has displaced native amphibians in many places; since introduced (for frog legs - bon apetit! ), it has increased in numbers sufficient to threaten native populations of frogs and turtles. Red-legged frog, western pond turtle, and painted turtle populations have declined because of predation by bullfrogs, who eat tadpoles and eggs, in addition to habitat loss and degradation. Here at the nursery, a bullfrog threatened our native red-legged frogs and tree frogs, so we caught it in a trap (they like cat food and sardines), and banished it! You can tell a bullfrog by its habit of making a "eeeeeeeee!" sound when it jumps; native Pacific tree frogs, on the other hand, serenade us with their familiar "ribit" throughout the evening and night hours every spring during mating season, and red-legged frogs communicate under water. Many non-native plants have invaded greenspaces and choked out native plants. Buddleia (butterfly bush) planted in gardens spreads by seed and quickly takes over. It has recently been added to the Portland nuisance plant list (below) because of its aggressive nature. Good substitutes for buddleia include Ceanothus thrysiflorus, a beautiful native evergreen with gorgeous blue flowers in spring, and any of our native Spireas. See our butterfly page for more suggestions! Other invasive "exotics" include English ivy, which competes with native vegetation in many woodlands, and wins, often killing trees in its path, and Canary reed grass, which has choked out native grasses and undergrowth in open spaces all over our region. There are many examples of introduced plants and animals that threaten native species, and much every gardener can do. Do not plant invasive exotic species, whose seeds are often spread by birds and wind to habitats outside your own garden. 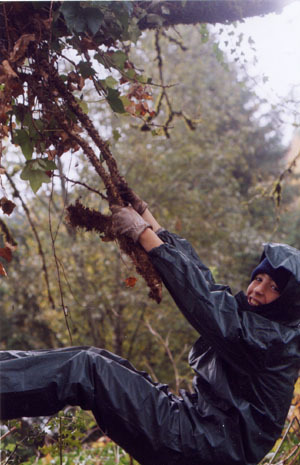 Volunteer to eradicate invasive species with an environmental organization - there are many annual "ivy pulls" in a variety of public spaces every year. And of course, plant native! to renew declining species and feed native wildlife. Remember to plant natives densely when removing invasive exotics from your land, so that they have a chance to out-compete re-emerging nuisance plants.